The tax laws allow you certain tax benefit for life insurance premium paid. It also allow you tax exemption in respect of the Life insurance policy. These benefits are available subject to certain conditions. Let us understand it. Under Section 80 C of Income Tax Act, you can claim deduction for life insurance premium (LIP) paid by you upto Rs. 1.50 lakhs in a year along with other various items including for Public Provident Fund, Provident Fund, tuition fee, repayment of home loan, NSC, ELSS etc. The deduction in respect of life insurance premium paid can be claimed only in respect of life insurance policy on the life of yourself, your spouse and any number of your children. It is not necessary that the child should be financially dependent on you. You can effectively use it for tax planning and thus reduce the overall tax outgo between parents and earning children. Due to meager limit of Rs. 1.50 lakhs of Section 80C which is crowded by many big tickets items like provident fund contribution, home loan repayment, it gets exhausted early and for many of the eligible items you are not able to claim the deduction. Likewise for senior citizens for whom only limited items are suitable and thus available under Section 80C, they are not able to utilise this limit of Rs. 1.50 lakhs and thus goes waste or is invested in low yield products like bank FD. In such a situation the life insurance premium can be paid by senior citizen parent and thus maximise the overall tax benefit. The deduction for premium is restricted to 10% of the sum assured u/s 80 C. In case the sum assured is less than ten times of the premium the deduction can only be claimed for 10% premium and the excess shall not be eligible for deduction. The law treats differently abled person differently for this deduction and for them the eligible amount of premium is at higher percentage of 15% of sum assured. This deduction can be claimed for any product of life insurance companies be it a term plan or a traditional plan or a Unit Linked Plan (ULIP). However in case the premiums payments are discontinued within first two years since inception of the policy or if the policy is let lapse before completion of first two years, the deduction under Section 80 C cannot be claimed for that year. Moreover the deductions claimed earlier years are reversed and treated as income of the year in which the policy is let lapse. The deduction is also available in respect of any rider like personal accident rider opted with the base policy within the limit of 10% or 15%. Please note that You cannot claim any deduction if you buy the personal accident insurance stand alone. The death claim received under life insurance policy is fully exempt in the hands of the nominees under Section 10(10D). 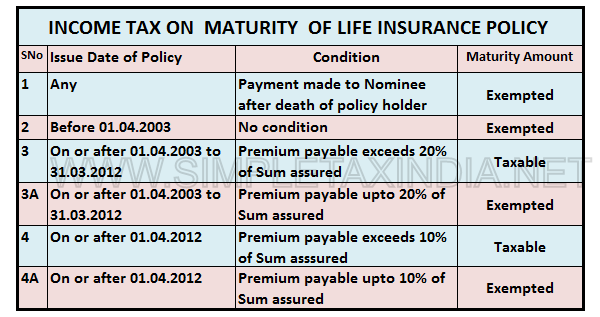 Except for death claims, the money received on insurance policy whether on maturity or otherwise is tax free only and only if the amount of premium paid on such policy did not exceed 10% of the sum assured in any year of the tenure of the policy in respect of life insurance policies bought after 1st April 2012.So even if the premium paid for a single year exceeded 10% of the sum assured whole of the maturity proceed becomes fully taxable.The limit for policies bought between 1st April 2003 to 31st March 2012 is 20%. Since the ULIP allows you to top up your policies, be careful while topping it up so as to ensure that the total premium including the top up premium does not cross this limit or the money on maturity becomes fully taxable in your hand due to such negligence. In case of life insurance policies bought for differently able person or those suffering from severe ailments, the premium limit for exemption under Section 10(10(d) is higher at 15% with respect to the sum assured from 1st April 2013. Money received under Keymen’s Insurance is fully taxable. If the money being paid to you is taxable, the life insurance company is mandated to deduct tax at source @ 1% of the sum being paid if the amount exceeds Rs one lakh.